This smart Word CV template uses the Helvetica font and a free download link is included in the file itself, in case you don't have it already. Helvetica has been shown to be one of the most effective fonts to use on a CV - it is clean, modern and easy to read, and has just the right level of professionalism. This template has a crisp simple layout and is built with tables, making it easy to customise and expand with your own information. The design can be printed in greyscale if you don't have a colour printer and will look just as attractive as the blue box version. Helvetica free Word CV template	Overall rating:	4	out of 5 based on 2	reviews. Our Helvetica Word CV template is stylish without being fussy. 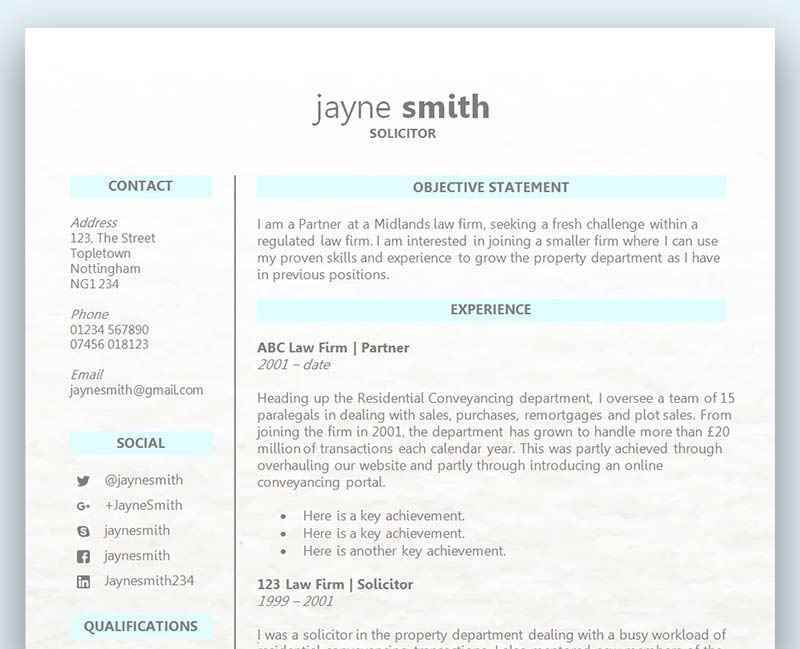 A great font and neatly laid out sections divided up with boxes make it really easy to navigate and read for prospective employers. There's the usual sections you'd expect on a CV - including a space for your objective, work experience, education, skills and references - and you can copy and paste one of the boxes if you'd like to add further information to suit your own needs. The ‘Objective’ section at the top of the template has three purposes. First, you can briefly summarise who you are, and second, you can tell your prospective employer what exactly you’re looking for. You might say for example that you’re a junior marketing assistant looking for a more advanced role where you can build on the skills and expertise you’ve acquired. Finally, this spot is a great place to include some of your key projects and any related achievements. Where possible, prospective employers like to see measurable results for this type of information – so, for example, don’t just say ‘this project was very successful’. Instead, briefly describe the project, say what the goal was, and then say how far you achieved the goal. Don’t write too much – it’s meant to be a quick snappy summary to catch your prospective employer’s attention and persuade them to read the rest of the CV. Be specific – avoid fluffy words and phrases such as ‘I work well both on my own and in a team’ ‘I’m hard working and dedicated’ ‘I enjoy a challenge’. If these are in fact true, offer more specific examples of how they are true. Use CV power words where you can – here’s a great list from website ‘Careerealism‘ (opens in a new window).